The 2019 Guest Operator Program is being restructured and is not being offered at this time. Updates will be posted here or contact the Museum. 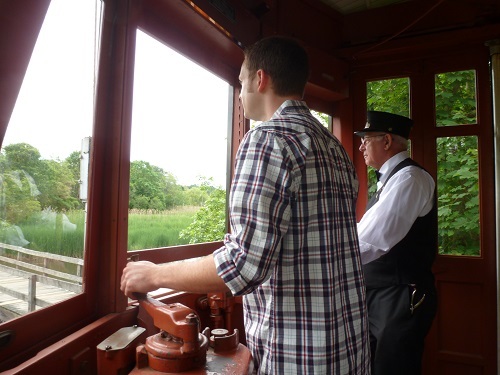 If you’ve always wanted to run a streetcar or subway train, take advantage of this opportunity at the Shore Line Trolley Museum by signing up for the Guest Operator program. You’ll be given an overview of operating principles by one of our instructors. Then it will be your turn to take the handles and operate solo! Don’t worry, you won’t have any regular passengers, just you, your instructor, and your invited guests. Guest Operation on a trolley car includes your individual admission, admission for up to three invited guests, and one year’s individual membership for yourself at the museum at the Associate level. You’ll also receive a photo-certificate of completion, suitable for framing. The 2018 fee for Guest Operation on a trolley car is $60 (which includes membership). $35 for current members. Guest Operation is scheduled by advance reservation only. The following trolley cars are generally available for guest operation but are subject to change: Connecticut Company 775, 865 and 1602, Johnstown 357, Atlanta 948, New Orleans 850. Payment in full is required at the time of your reservation. Guest Operation on a subway car includes your individual admission, admission for up to three invited guests, and one year’s individual membership for yourself at the museum at the Associate level. You’ll also receive a photo-certificate of completion, suitable for framing. The 2018 fee for Guest Operation on a rapid transit car is $70 (which includes membership). $45 for current members. Guest Operation is scheduled by advance reservation only. Payment in full is required at the time of your reservation. Note: the Guest Operator event is an entertainment service, and does not constitute an official training program. Many Guest Operators do, however, go on to take the museum’s official training classes which are offered separately.